In 2016, archaeologists and scientists from India and South Korea found these two "very rare" skeletons in a Harappan (or Indus Valley) city - what is now Rakhigarhi village in the northern Indian state of Haryana. For two years, they researched the "chronology" and possible reasons behind the deaths; and the findings have now been published in a peer-reviewed international journal. "The man and the woman were facing each other in a very intimate way. We believe they were a couple. And they seemed to have died at the same time. How they died, however, remains a mystery," archaeologist Vasant Shinde, who led the team, told me. They were buried in a half-a-metre-deep sand pit. The man was around 35 years old at the time of his death, while the woman was around 25. Both were reasonably tall - he was 5.8ft (1.77m) and she, 5.6ft. They were both possibly "quite healthy" when they died - tests didn't find any lesions or lines on the bones or any "abnormal thickness" of skull bones, which could hint at injuries or diseases such as brain fever. 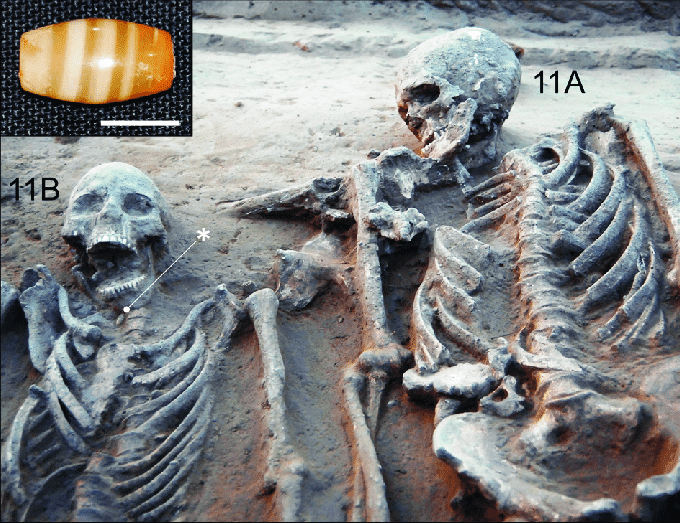 Archaeologists say this unique "joint grave" was not an "outcome of any specific funeral customs commonly performed at that time". They believe that the man and the woman "died almost at the same time and that, therefore, they had been buried together in the same grave". Everything else they found in the Rakhigarhi grave was unexceptional for its time: a few earthen pots and some semi-precious stone bead jewellery, commonly found in graves from the bronze age Harappan civilisation. 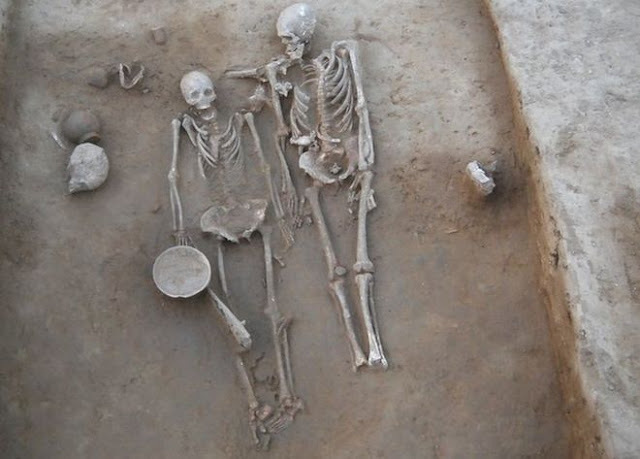 "The most striking thing about Harappan burials is how spartan they were. They didn't have grand burials like, for example, kings in West Asia," says Tony Joseph, author of Early Indians: The Story of Our Ancestors and Where We Came From. 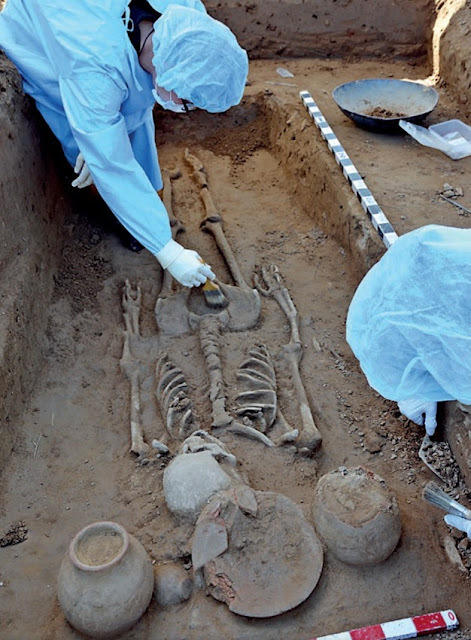 In the 1950s, the skeletal remains of a man and a woman, heaped on top of each other, were found in a sand pit in Lothal in what is now Gujarat. The skull of the woman bore injury marks. Some excavators made a controversial claim that the grieving woman had killed herself after her husband's death - a claim that could never be proved.